We began our activity by cutting a length of PVC tube. 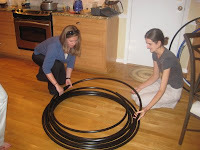 This is purchased in 100-foot quantities, which means that you should be fairly certain that you want to make a bunch of hula hoops (or get really into irrigation) before investing in this. 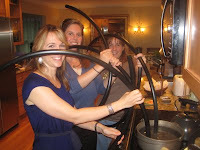 After cutting our lengths of tube (the bigger the tube, the cooler the dilettante) (taller people cut longer lengths of tube), we each put one end in a pot of boiling water to soften it up, and after doing so, jammed a plastic joiner into one end of it. (“Jammed” seems so indelicate, yet that is exactly what we did.) Then, we poured about a cup of water right into the tube as we softened up the other end in the boiling water and jammed the other end of the tube onto the joiner. And just like that, we were done and all that was left was to decorate the hoop. This sounds amazingly simple…and it was, with the right tools and materials. It was very satisfying (especially for a bunch of women with short attention spans) to be able to create this so quickly. Carly brought a huge assortment of colored tape with which we could decorate our hoops. Dilettante Amanda went with Denver Broncos orange and blue, Dilettante Amy went with her sorority colors of yellow and red, Dilettante Nicole went with a cool pattern of blue, yellow and magenta and Dilettante Kathleen (with an assist from Dilettante-in-training Avery) chose a rainbow scheme (in honor of Pride Week, of course). 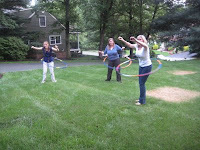 When we finished with our taping, we headed out to the front yard to try out our hoops. 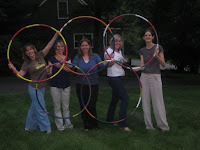 It was amazing how much easier it was to hula hoop with a hoop that had water inside – all of us were able to do it almost immediately. Carly was excellent at keeping the hoop going and also tried to teach us all a very cool trick, which we all attempted with varying degrees of success (“varying degrees” meaning that some of us managed to just hit ourselves in the head with the hoop, while others were quite literally swept off their feet). Without question, we are white. We ended the evening with some pizza, beer and great stories from Dilettante Amy's recent trip to Russia.